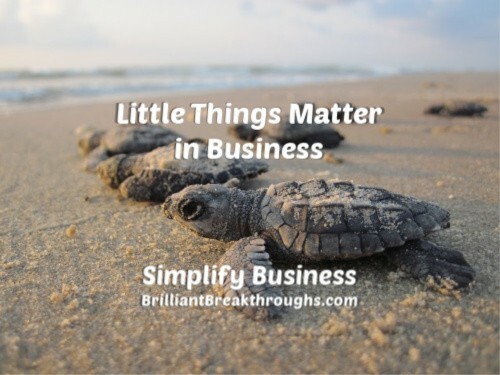 The little stuff matters myth-buster - Brilliant Breakthroughs, Inc.
Small Business Success and the little stuff are a perfect team. We’re told the little stuff doesn’t matter. In life this is more accurate, but in business it isn’t true! Your customers deserve the best offering and service, which requires addressing the little stuff. If you don’t get this right, it minimizes Your Business’s Success Rate. Ultimately negatively impacting your profit. Wow, not that I laid it all on the line, I guess I should pull back a little and discuss a couple points with you. The little stuff matters because it’s unique. What’s unique gets noticed. What gets noticed is remembered. What gets remember is the golden elixir for referrals, repeat customers, and raving fans. This is what generates BIG revenue – the little stuff! What was your last “wow” moment? Mine was yesterday when a friend of ole, who I haven’t seen much over the past 5 years, brought me some surplus harvest from their garden. Out of the blue, I had her thoughtfulness moment manifest as produce in my kitchen. I was wowed. This is an example of the little stuff. It looks a little different in business, but the feeling doesn’t change. If you, as a Small Business Owner, can evoke a favorable feeling within YOUR Customer or probable customer that moment is golden! Remember: What is unique is golden. It delivers revenue. What are you doing to make golden moments? The business term for this is differentiation. It’s still an important part of the customer experience. Are you playing small by overlooking the little stuff? If you’re like most Small Business Owners the answer is YES! … and this isn’t a good thing for YOUR Business. There is a significant difference between the little things and the minutiae. Think of it this way: minutiae = busyness while the little things = happy customers. Busyness keeps you snagged in the minutiae of not accomplishing anything that positively impacts your bottom line. Think of cat videos on social media. Do you need to do social media for business visibility? Yes. Cat videos – no. The little things could look like this: Gratitude Cards for Customers, Follow-up or Welcome Aboard Calls, Being Present with Customers, Adding an Extra Service, Birthday Reach-outs, or an Added Step in Your Customer Experience. The options are endless! This is the little stuff you make time to do. It’s time well spent and will build profit with consistency. These are the right type of actions to make happen. TIP: Work on the big things to drastically move YOUR Business’s Performance Needles in the right direction. Then work on the little stuff. Last: avoid the busyness trap! ← Does Consistency Matter in Customer Relationship Building?